Fits Mercruiser, OMC, Prestolite and more with .531 distributor shaft diameters. Usually in stock. 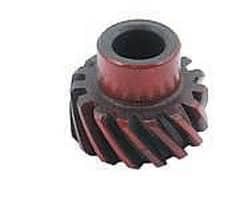 This gear is cut the opposite direction of the stock gear. Make sure your shaft is .531 diameter which is stock Prestolite and not .500 like ChevProMarine, Pertronix, MSD and others. Our gears do not have pre-drilled mounting holes purposely, making it easier and more accurate for you to drill a 1/8" hole and install a hardened 3/4" long roll pin. Pre-drilled gears may cause serious problems when trying to install into a previously used hole causing misalignment. (an MSD instruction sheet is included) Cast iron hardness RC-20 same as original. NOTE: If you need to fit a .500 shaft see our separate listing for this.